Croppies Acre, in a very central location of Dublin city between Benburb Street and Wolfe Tone Quay on the banks of the River Liffey, is walked and driven past every day of the week by many thousands of people, the vast majority of whom are unaware of the importanance of this large green field. Behind it sits Collins Barracks (The National Museum) and in front of it runs the Liffey with the Guinness buildings opposite. The Obelisk in the Phoenix Park can also be seen from this much ignored plot of land. 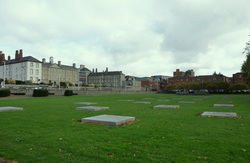 The large green field, named Croppies Acre, is in fact a mass burial ground where hundreds of those Irishmen involved in the Uprising of 1798 were executed and buried. 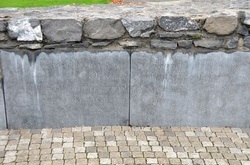 The stone slabs dotted around the land are meant to represent gravestons of those dead Irishmen and women. However, of course, no individual grave is marked and the stones are simply for design. 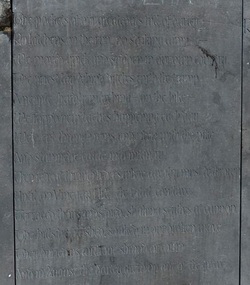 It is thought by some that many of the bodies placed there at the end of the 18th century were over the 19th century probably washed away by the River Liffey which runs parallel to it, and which during high levels may have come up and covered the land from time to time, washing away some of the bodies which would not have been buried very deeply. The name "Croppies" comes from the nick-name given to the fighters in Uprising because the cropped their hair short emulating the short of "cropped" hairstyles worn by the French soldiers of the time. All around the interior of the monument are stones encased in the stone wall. Some of the stones are plain and unembellished, others have patters carved into them, and yet others have words carved into them. Below are photographs of the stones and the words carved on them. Written on two stones with the question on the left stone and the answer on the right. "What is that in your hand?" . . . . . "It is a branch." "Of what?" . . . . . "Of the Tree of Liberty." "Where did it first grow?" . . . . . "In America." "Where does it bloom?" . . . . . "In France." "Where did the seeds fall?" . . . . . "In Ireland." "Requium for the Croppies" is a poem written by the Nobel Prize winning Irish poet, Seamus Heaney (b.1939) about the 1798 Rising and published by him on the 50th anniversary of the later 1916 Rising. And in August the barley grew up out of the grave." "History Is Only Important ..."
"History is only important while it is being made. What matters most is what you do today and tomorrow."